Dial, at home near Bessemer, Ala. "Art," he once said, "is strange-looking stuff." American Artists don't have to be licensed  a good thing, that  but they do tend to be credentialed. The art world is bristling with degrees from Yale and Cal Arts and hundreds of other academies. In that world, Thornton Dial stands out. He has no formal training and very little schooling of any kind. To be blunt, he can't read or write. But sometime during his long years as a metalworker in Alabama, he turned to making what he at first simply called "things," because it would be a long time before he, or anybody else, realized that those things are better described as art. And not just that, but some of the most assured, delightful and powerful art around. Dial's work has sometimes been described as outsider art, a term that attempts to cover the product of everyone from naive painters like Grandma Moses to institutionalized lost souls like Martín Ramírez and full-bore obsessives like Henry Darger, the Chicago janitor who spent a lifetime secretly producing a private fantasia of little girls in peril. But if there's one lesson to take away from "Hard Truths: The Art of Thornton Dial," a triumphant new retrospective at the Indianapolis Museum of Art, it's that Dial, 82, doesn't belong within even the broad confines of that category. The show  which is on view in Indianapolis through Sept. 18, then travels to New Orleans; Charlotte, N.C.; and Atlanta  is a sign that after more than two decades in which his work has settled gradually into the collections of a number of major museums, he may at last be achieving a kind of cultural escape velocity. What he does can be discussed as art, just art, no surplus notions of outsiderness required. When I asked Dial recently what led him to make his work in the first place, he gave a sideways answer: "I put it out there for somebody to like." People do. People will. 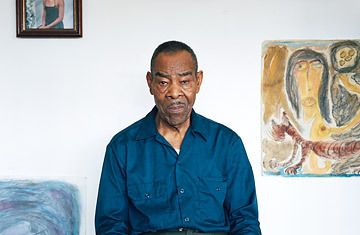 This is not to say Dial's backstory won't always set him apart from other prominent African-American artists like Martin Puryear, Kara Walker, Glenn Ligon and Lorna Simpson, who are university- and art-school-educated. He was born in 1928 in a cornfield in rural Sumter County, Alabama. His mother, an unwed teenager from a sharecropper family, gave him up to be raised by female relatives. Working in the fields by the age of 6, Dial got little in the way of a formal education. When he left school for good at the age of 12, he was still in the third grade. It was at about that time, after the death of his great-grandmother, that Dial and his younger half brother went to live with another relative in Bessemer, a midsize industrial town near Birmingham. He worked there in a succession of jobs until he found the one he would hold for years, as a metalworker with the Pullman railway-car company. After starting a family of his own, he began to produce "things" of all kinds at home. Some were practical, like fishing gear, grave markers, decorative fences and furniture. Some were more explicitly art objects, like animal sculptures. All were made with scavenged materials: rope, metal, plastic, tin. "I started picking up stuff," he says. "Beer cans, plastic bottles. I was making stuff to sell." He made a lot of it  until it was piling up everywhere in the house he shared with his wife Clara Mae Murrow and their five children. "My wife told me, If you don't get this junk out of the house, I'm going to leave you," he says. In 1981 the Pullman plant shut down, and Dial, in his early 50s, found himself out of a job. But as his son Richard says, "It was probably the best thing that ever happened to him. He kept getting up at 7, going into the backyard and making something." Another self-taught artist, Lonnie Holley, brought Dial to the attention of Will Arnett, a white Atlanta-based collector focused on the work of vernacular Southern black artists. Dial credits Arnett with making him think of himself as an artist, helping his work find its way into the collections of people like Jane Fonda and launching him into public view. Sometimes it was too public. In November 1993, when Dial was the subject of two simultaneous one-man museum shows in New York City, Morley Safer did a segment on 60 Minutes that asked whether Arnett had questionable financial dealings with the artists he collected. Dial, who appeared on camera briefly, felt that Safer's questions for him were condescending and that the broadcast led museums and collectors to shy away from his work at the very moment it had begun to take off. If it did, the Indianapolis show  drawn largely from the collection of Arnett's Souls Grown Deep Foundation, which has right of first refusal on Dial's work  is a sign that momentum is back in his favor. See scenes of pivotal moments in U.S. civil rights.